This betel or paan box or pandan is one of the nicest of its type that we have seen. Of circular form with a convex lid and with deeply ribbed sides giving it a Mughal architectural quality, its great age is evident from the deep red-brown hue of the brass. Together with contours softened by time and use, the effect is that of a mound of sculptured chocolate. The construction is solid and the lid fits well. The lid and sides comprise alternating prominent and less prominent ribs separated by double-beaded lines. The apex of the lid has a raised roundel engraved with a lotus flower design within dashed borders. 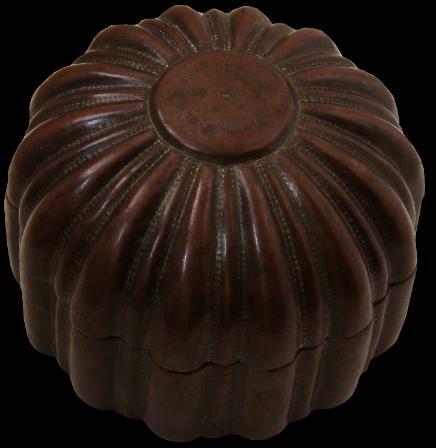 The lid is closed by matching a small arabesque design etched into the base with that on the lid, so that the ribs align perfectly and the box can be closed. Betel chewing is a habit that unites Southeast Asia with the Indian sub-continent, parts of southern China and the Western Pacific. Whereas alcohol was associated with feasting, betel was the everyday social lubricant: it was offered to visitors to one’s home. And just as the English developed elaborate tea sets, Indians and Southeast Asians developed elaborate betel nut sets. The actual nut comes from the areca palm tree. Typically, it is sliced, mixed with lime (usually obtained from crushed seashells) and then wrapped up in a betel creeper leaf and chewed. 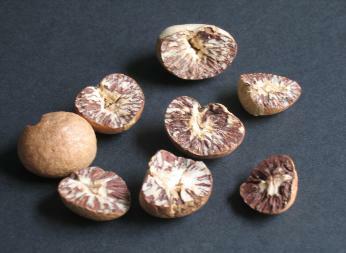 The lime reacts with compounds in the nut to produce alkaloids which give a mild narcotic effect.